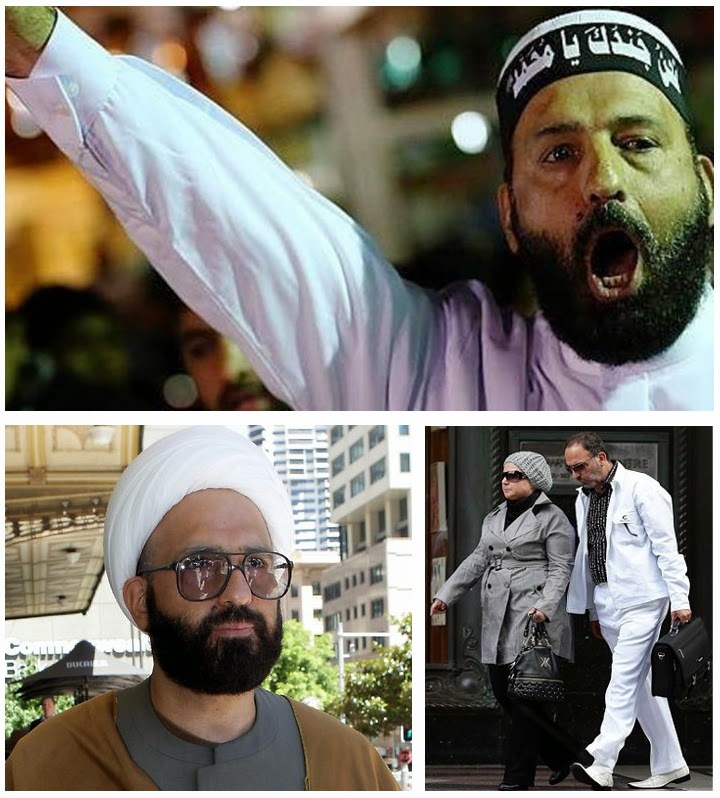 Land Destroyer: The "Shape-Shifting Sheik" and the "Sydney Siege"
The "Shape-Shifting Sheik" and the "Sydney Siege"
Suspect had multiple aliases, granted political asylum by Australian government, interviewed by Australian media, spent years as fake pro-Western "Shia'a cleric" condemning Iran and Syria before recently "converting" to Sunni and supporting ISIS. 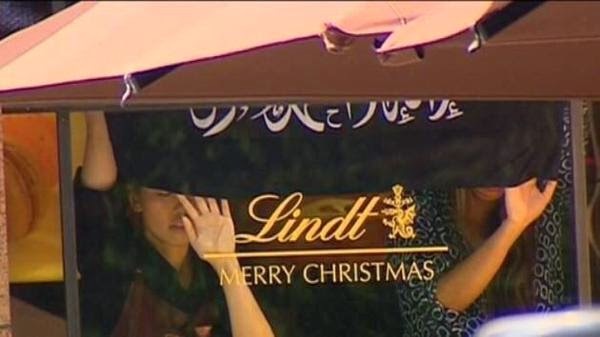 December 16, 2014 (Tony Cartalucci - LD) - Another embarrassing chapter has unfolded for Western intelligence and security communities in the wake of the so-called "Sydney Siege." The suspect named by the media as "Man Haron Monis" also has gone by the names "Manteghi Boroujerdi" and "Mohammad Hassan Manteghi" and was an individual now confirmed to have long been on the radar of the Australian government, media, law enforcement, and court system since his arrival on Australian shores almost two decades ago. Image: Anti-Western ISIS Wahabi terrorist, pro-Western "liberal" Shia'a cleric, and secular common man. As with any long-time actor, the "Sydney Siege" suspect has been cast for many diverse roles, with many different names, and an extensive wardrobe. He had played both the hero and the villain. It is beyond bizarre that he has remained in the spotlight across Australia's political stage for nearly two-decades with a growing criminal record, increasingly disturbing and disruptive behavior, and yet somehow "eluded" Australia's indiscriminate and all-invasive surveillance network and multiple terror sweeps made just in the past several months. It appears that this "shape-shifting sheik" played a central role in manipulating the Australian public at integral junctures of the West's "War on Terror." Claiming he was a "lone wolf" attacker whose violence and extremism could not have been foreseen is betrayed by an extensive criminal record including murder, preceded by the suspicious circumstances that brought him to Australia to begin with. He fled Iran in 1996 for unknown reasons, claiming in a 2001 Australian ABC interview that he was formerly of Iran's "Ministry of Intelligence and Security." He claimed in the same interview to have been in contact with the UN about "secret information" he had regarding the Iranian government. In Iran, mostly I have been involved with the Ministry of Intelligence and Security. the Iranian regime wants to make me silent, because I have some secret information about government, and about their terrorist operations in the war. I sent a letter to the Secretary-General of the United Nations and somebody on behalf of Mr Kofi Anan sent the answer, and they want to do something. If we explain about the meaning of the word 'Islamic' as a religious society, if we say Islamic society is a religious society, and a society which has a relation with God, and wants to be honest, we can say Australia, Canada, England, USA, so many western countries, they are religious societies. They don't say 'We are religious', but in fact the spirit of religion, we can see the spirit of religion in these societies. And some other countries in the Middle East, in Asia, they say 'We are Islamic' they have a name of Islamic, but in fact they are not religious societies and religious governments. Whenever I walk in the street, whenever I go out in Australia, I feel I am in a real religious society. I don't want to say it is perfect, we don't have a perfect society on the earth, but when we compare, if we compare Australia with Iran and other countries in the Middle East, we can say it is heaven. People in Sydney walking past the State Parliament buildings on Macquarie Street in recent weeks might have noticed a tall Muslim cleric who has taken up residence in a tent on the footpath outside. He is Ayatollah Manteghi Boroujerdi, a liberal cleric who fled Iran four years ago after being very critical of the Iranian regime. Ayatollah Boroujerdi's wife and two daughters are now under house arrest in Iran, and he's hoping the Howard government will put pressure on the regime there to let his family join him here in Australia. Far from an extremist - Boroujerdi/Monis/Manteghi instead posed as the perfect poster child for the ongoing anti-Iran, pro-war propaganda building at the time - propaganda that continues to this very day and is an integral part of current efforts to overthrow both the Syrian and Iranian governments. He was a "liberal Iranian" fleeing the "Iranian regime" who held his family "hostage." He professed his admiration of Western society and praised it as "heaven." "Heavenly" could have also described his propaganda value to the West at the time. Over the years, however, Boroujerdi/Monis/Manteghi would shape-shift, coincidentally along the same unsavory lines Western pro-war rhetoric shifted - first by helping discredit anti-war sentiment in Australia by sending abusive letters to the families of fallen soldiers, then discrediting Islam itself through cartoonish acts of rhetorical extremism. And just like a shape-shifter, the character Boroujerdi/Monis/Manteghi would don many different costumes. Image: Hostages in the recent "Sydney Siege" hold up the flag often used by terrorist group "Al Nusra" currently fighting America's proxy war in Syria against the government in Damascus. Al Nusra has received US anti-tank weapons after front groups the US assured were "vetted" and "moderate" turned them over while pledging allegiance to the Al Qaeda franchise. The UK Independent would also report that the suspect requested specifically an ISIS flag. At times he would appear as a secular liberal dressed in Western, if not outdated attire, at other times a "Shai'a cleric" wearing traditional robes. Most recently, to help sow ISIS hysteria, he impersonated an ISIS supporter, claiming to have "converted to Sunni Islam" a month ago, wearing Wahabi-inspired terrorist attire. And in his final act amid the "Sydney Siege," he would produce the flag often carried by Al Qaeda affiliate Al Nusra in Syria - a terrorist front that has in fact drawn many Australian's from Sydney over the course of the recent Syrian war. His alleged ideological causes were as contradictory as his attire. First claiming for years to be a pro-Western "liberal Shia'a," dressed as a Shia'a cleric, his recent shift to supporting ISIS terrorists would mean he was backing a terrorist front of Wahabists - enemies of Iran and the Shai'a communities across the entire Muslim World that depend on Tehran for protection. It would also mean he was adopting an ideology that at least rhetorically claims to stand in complete opposition to the West he had previously claimed to admire. FEDERAL agents have been urged by the nation's senior Shia leader, Kamal Mousselmani, to investigate an Iranian man purporting to be a prominent Islamic cleric. What could have possibly motivated the Australian government to continue giving a clear and persistent menace to society free reign? The state-run Iranian news agency, Fars, quoted a Foreign Ministry spokeswoman, Marziyeh Afkham, as saying that it had warned the Australian authorities about Mr. Monis. “The history and mental-psychological conditions of this individual, who sought political asylum in Australia more than two decades ago, had been discussed with Australian authorities many times,” Ms. Afkham was quoted as saying. However, were that the case, and had Iran warned Australian authorities of this man, one wonders why he would be allowed political asylum in the first place, let alone allowed to occupy the spotlight amid Australia's divisive political landscape for so long, especially in light of his many alleged criminal offenses. Considering the global surveillance state Australia finds itself a willing partner in, how is it possible to claim Boroujerdi/Monis/Manteghi was a "lone wolf" terrorist? Surely if Australians are being surveilled without probable cause, so too was Boroujerdi/Monis/Manteghi, and yet he was apparently able to obtain weapons, travel freely with them, all while publicly supporting terrorist organizations including ISIS. According to a portion of his now-deleted website (which you can see here) ... Monis pledged allegiance to ISIS before the attack. Vox would go on to cite Washington-based Neo-Conservative pro-war, anti-Iranian think-tank, the Foundation for the Defense of Democracy (FDD) to claim Boroujerdi/Monis/Manteghi had no ties to ISIS and that he was simply a "fruitcake." No evidence was provided. However, this "fruitcake" was credible enough to be granted political asylum by the Australian government in 1996, credible enough to serve the West's propaganda campaign against Iran in 2001, and then play along with the West's coordinated strategy of tension designed to discredit anti-war sentiment during Australia's participation in the invasion and occupation of Afghanistan, and more recently ratchet up anti-Islamic sentiment and help justify continued Western military intervention in nations like Syria and Iran against which both Boroujerdi/Monis/Manteghi and the FDD are/were clearly opposed to. Siege" suspect who openly pledged allegiance to ISIS. In fact, if unable to convince Australians to back "liberals" like himself in opposition to the Iranian government, perhaps he and his handlers felt posing as an extremist to provoke support for direct military intervention in Syria and in turn, Iran, was the next best bet. One thing is for sure, for a man in Australia's political and legal spotlight either for good or for bad for nearly two decades, it is highly unlikely he was able to put together this plot without Australian security and intelligence agents knowing. 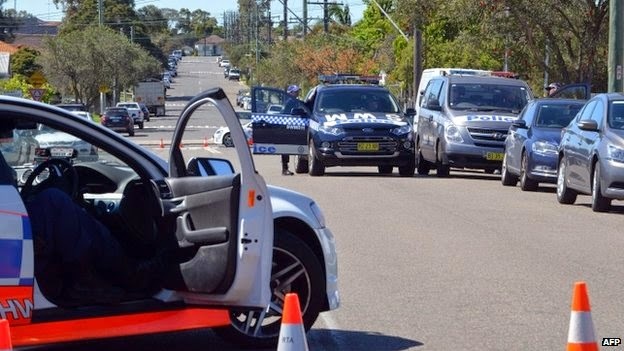 After several recent "anti-terror" operations carried out across Sydney based on intercepted communication, why hadn't federal agents also visited a suspected murderer openly pledging allegiance to ISIS? The Western media's eagerness to dismiss Boroujerdi/Monis/Manteghi's actions amid the "Sydney Siege" before a full investigation reeks of a cover-up and whatever the truth may be - what is being insisted upon by the media, government, and corporate-funded think-tanks now certainly isn't it.